Sunday's game session was a special entry into our group's game history. We gave a trial run to using Terraclips for our dungeon layout. We used the Dungeon Rise - Dungeon Essentials set and I must say, even with a little bit of extra time needed to set up, this was awesome. We played down at Good Games Hurstville, my local gaming store, amoung about a dozen groups playing their own games, mostly card games. The set up was quite cool, and we had a few people come over and check us out while we played. 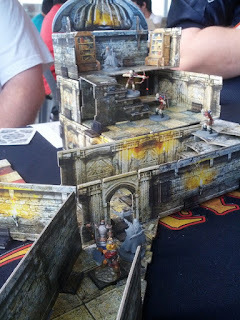 The photo below is of the final fight of the chapter, after a few puzzles and traps and a relatively easy fight against some giant spiders, they discovered a library deep within the buried crypts. There were a few skeletal archers guarding a spectral figure that was using the library (or haunting it) and the fight ended up being a fine example of planning and teamwork. We got to see some experimentation with creative spell casting and combining effects from multiple casters to achieve results. I felt that the rules we were testing were capable of supporting the various tactics used by the players, and that the few issues we raised were able to be corrected with minor adjustments to the established guidelines. Although the Core Rules do not have a section on combined casting, it is one of the additional elements being planned for release in one of the spell casting supplements. Talents are not being activated enough to make a difference to gameplay (only about 1 every other game) due to the cards required to activate being hard to gain. A solution is to incorporate Jokers into the decks to act as Wild Cards, having a value of 10 and being any Face Card required.